Syd Ball was born in Adelaide, and has exhibited his work in Australia and internationally for almost 50 years and in Sydney since his first solo exhibition at Watters Gallery in 1966. He was Senior Lecturer in Art at the City Art Institute (now COFA) from 1974-88, and currently lives at works at Glenorie on Sydney’s outskirts. 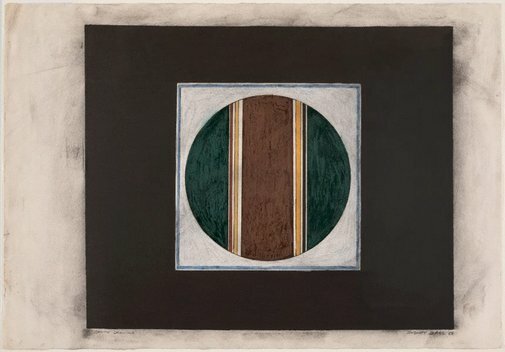 Ball studied printmaking in Adelaide and America, and it has been a recurring feature of his work, influencing and being influenced in turn by his painting. Signed and dated l.r., pencil "SYDNEY BALL '66". Gift of the artist 2010. Donated through the Australian Government's Cultural Gifts Program. Janine Burke., Sydney Ball survey 1965-1975 , 'The paintings of Sydney Ball', Newcastle, 1975. General reference. Anne Loxley, Sydney Ball: the colour paintings 1963-2007 , 'Sydney interview, pg. 13-15, Penrith, 2008. General reference. Victoria Lynn, Sydney Ball - Prints: Cantos + Stains , Sydney, 2008. General reference. Victoria Lynn, Sydney Ball: a jubilant light , 'Introduction', pg. 4-6, Wollongong, 1989. General reference.